Details: Dietary Supplement. Oil-based anabolic technology. Ignite massive pumps, energy, strength, power & focus. Pre-workout liquid ester technology! Super fast acting liquid delivery! Maximum strength formula! 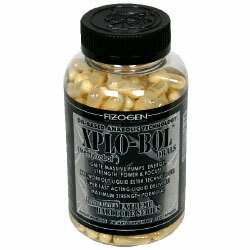 » Xplo-Bol Orals is an explosively powerful pre-workout formula powered by first ever oil-based anabolic technology! By utilizing this rapid lipid delivery system, the patent pending esterified nitric oxide generators and muscle cell expansion catalysts explode pumps to enormous size! Additionally, Xplo-Bol Orals contains powerful neural stimulators to ignite incredible focus, energy and enhanced mind body muscular contractions. Xplo-Bol is the most powerful pre-workout and capsule delivery product available and may promote dramatically increased workout intensity, pumps, strength and endurance during training. » Be certain to eat maximum of 1.5-2 grams of protein per pound of body, weight, per day, for maximum effects. The process of (protein synthesis) requires optimal resources of protein to maximize anabolic processes during times of intense training. Ingredients: Other Ingredients: Sesame Oil, Conjugated Linoleic Acid, Gelatin, Titanium Dioxide, Silica. Xplo-Bol: Methylxobol (Anabolic Pump Expansion Blend) - Arginine Decanoate, Creatine Decanoate, (S)-2-Amino-4-Methylpentanoic Acid Ethyl Ester HCl, (S)-2-Amino-5-Guanidinopentanoic Acid Ethyl Ester HCl. Xo-Drol (Extreme Nero-Stimulant Complex) - Di0Caffeine Malate, Caffeine, Vinpocetine, Vincamine, Vinburine, Glucoronolactone, L-Taurine Ethyl Ester HCL. Xo-Bolin (Base Volumizing Blend) - Di-Creatine Malate, L-Arginine, L-Taurine. DirectionsPre-Workout Use: Take 4-12 oil-based capsules, 30-60 minutes before training, on an empty stomach. Begin use with a lower dose to assess for tolerance. Taking too close to bedtime may cause sleeplessness to occur.